In Sanskrit Lina means to unite and Linga means Union. Same meaning as Yoga ( yug - to unite, yoga - union ). While the Arabs took the Cube as the perfect mathematical symbol, the Rishies took the Ellipsoid or Linga as the mathematical emblem of perfection. The Visible Linga represents the Visible Universe and the Linga below, the Invisible Universe ! Atma Linga means the Self as the Ellipsoid, the completest mathematical symbol. The Absolute Self is defined as That having Center everywhere, Circumference nowhere. Mythology has it that the demon King, Ravana, threw the cloth covering the Atma Linga, when he tried to lift it and the cloth fell here. And Lord Shiva willed that Murudeswar, where the cloth fell, should be one of his five holy places. This lovely temple surrounded by the sea on three sides, is situated on a small hill, Kanduka Giri. It is guarded by two giant elephants in concrete. 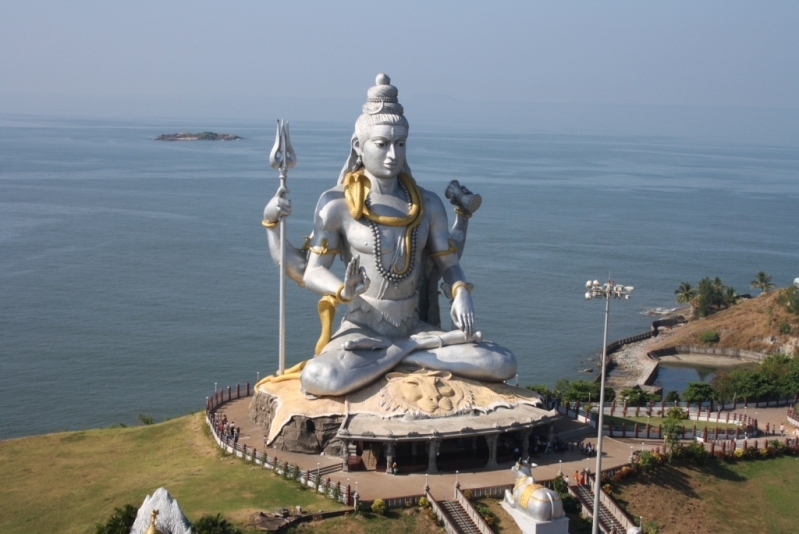 It is one of the best Spiritual Tourism centers in India. 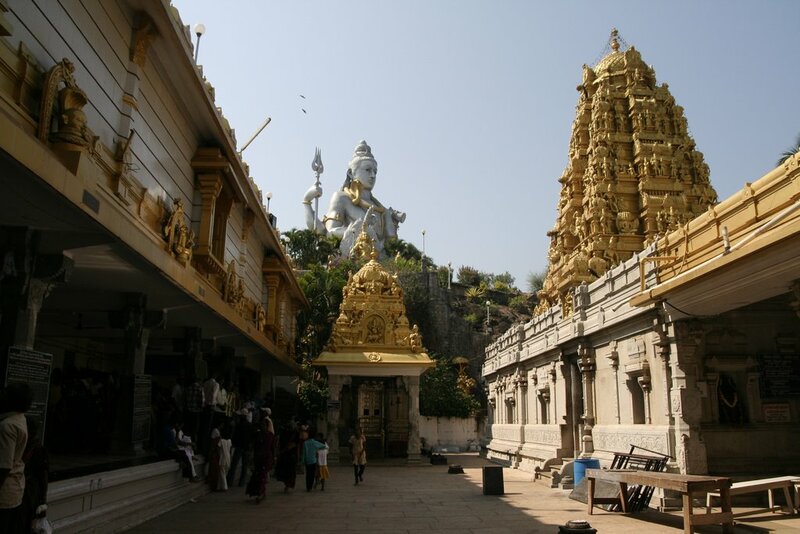 A Lord Shiva statue made up of bell metal is located outside the temple. This is a superb spot, full of scenic beauty. With the majestic tall hills and the greenish coconut trees around. 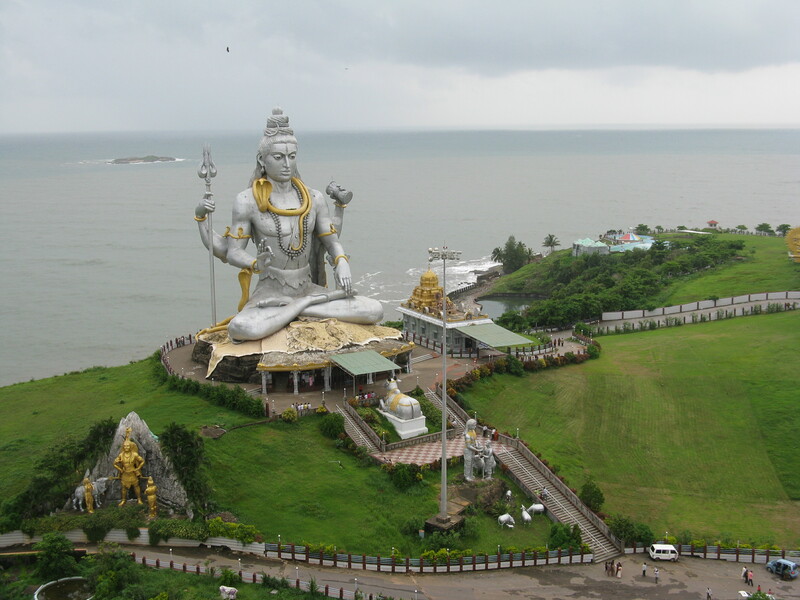 It is located in Bhatkal District, in Karnataka State. Ravana worshipped the Self Ellipsoid or Atma Linga for Self Actualisation. Lord Shiva appeared and asked him for any boon. Ravana asked for the Mother of the Universe, Goddess Parvathy ! Narada tricked Ravana into believing that Parvathy was in Hell or Pathala. So Ravana went to Pathala and married a King's daughter, thinking that she was Parvathy ! Ravana then realised his mistake, got angry with Narada and mediated to please Lord Shiva. Lord Shiva gives Vision and Ravana asks for the Atma Linga. Lord Shiva gives the Atma Linga, on one condition that it should never be placed on the ground. Lord Vishnu blocked the Sun and Ravana had to do his evening rites. Since he could not do evening rites without placing the Atma Linga on the ground, he asks a Brahmin boy ( Lord Ganesh disguised ) to hold the A L for him. Ganesh struck a deal, saying that he will call Ravana thrice and if he does not answer, will place the A L on the ground. Ganesh placed the A L on the ground, even before Ravana could perform his rites and Vishnu removed the illusion ! Ravana got annoyed when he knew that he was tricked. 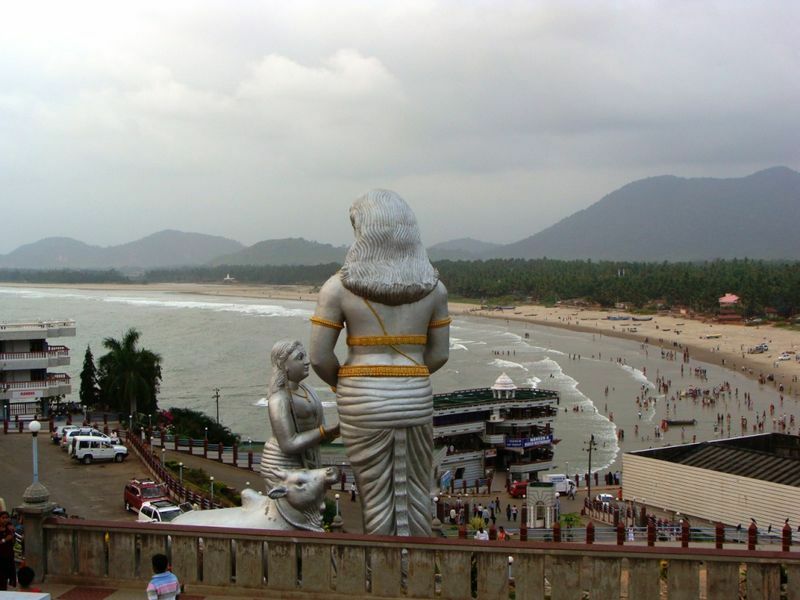 He flung the cloth to Murudeshwara ! 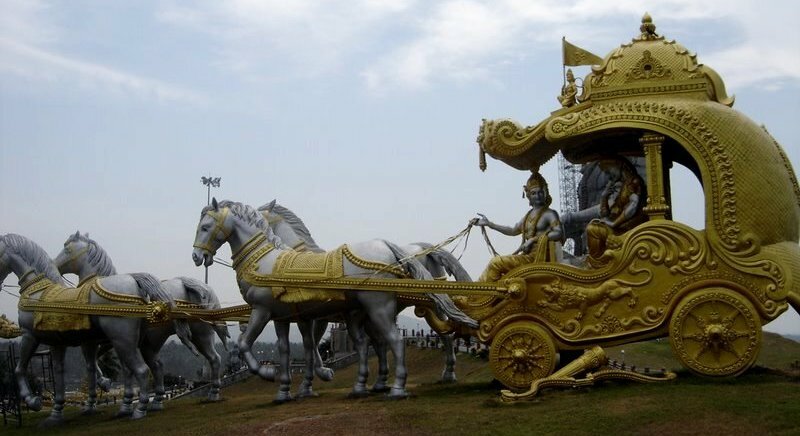 Statues of Lord Krishna and Arjuna, in the midst of battle, with Lord Krishna singing the Song Celestial, the Bhagavat Geetha. 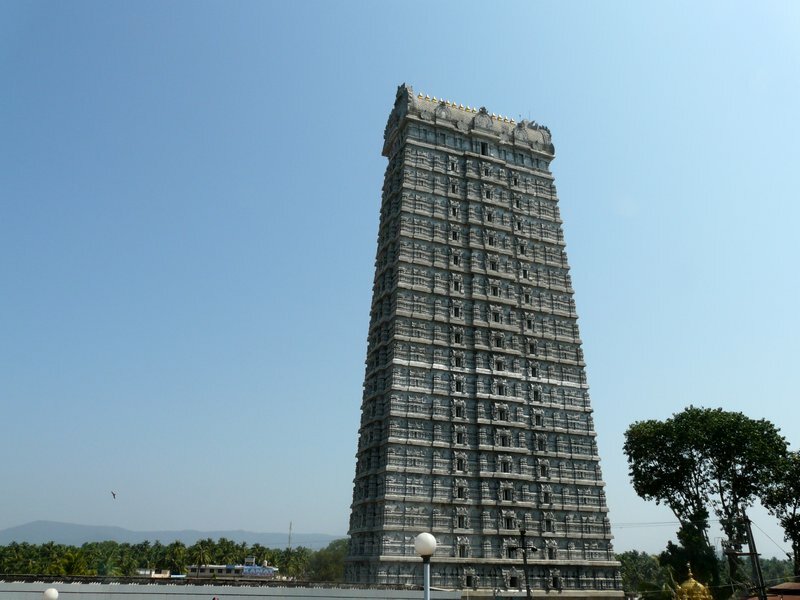 The 20 storied Gopura ( Tower ) is one of the tallest in Asia. 33 crore deities of Mythology ? What are they ?